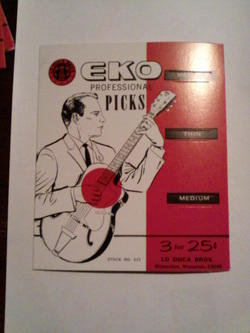 Fender Playing Cards Tin-2006(See 'Fender' section for more detailed pictures. 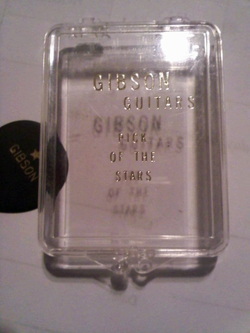 Closer inspection shows the details of the front side of the package's tag. 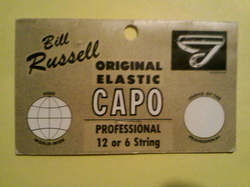 Reverse of above label. 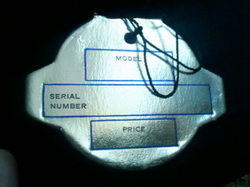 Nowhere on the product does it have a date. 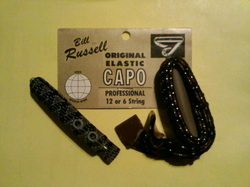 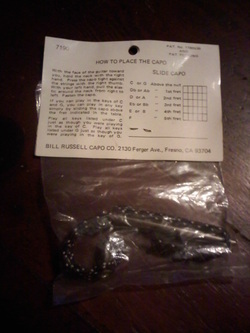 The Bill Russell Capo Co.'s address is listed as Fresno, CA. 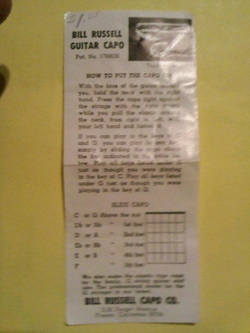 Insert showing how to apply capo to the instrument. 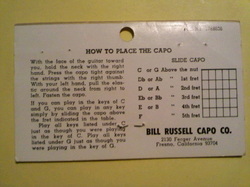 The reverse side of this insert is blank. 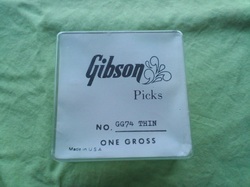 Gibson 1972 Gibson/Epi/Jubilee catalog. 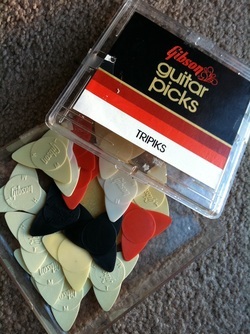 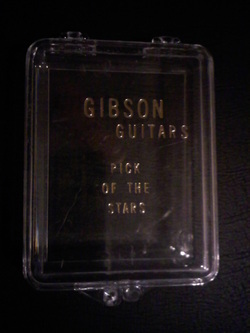 See 'Gibson' section for additional pictures of the goodies inside!! 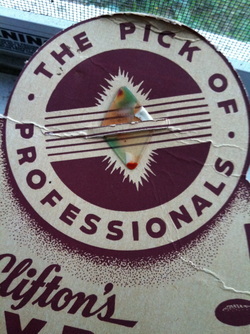 Vintage 1960s D'Andrea 'Bullseye' pick guitar pick box. 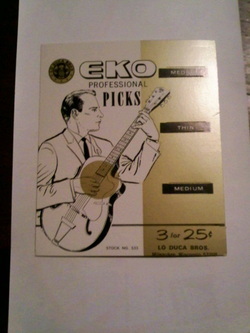 10 cents ea. 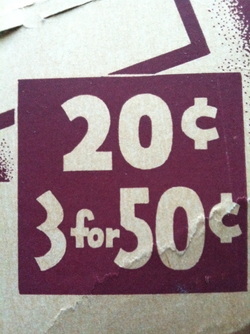 or 3 for .25 cents!! 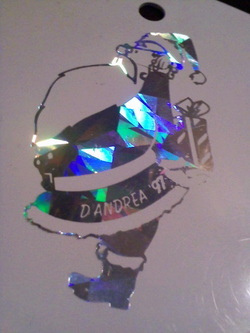 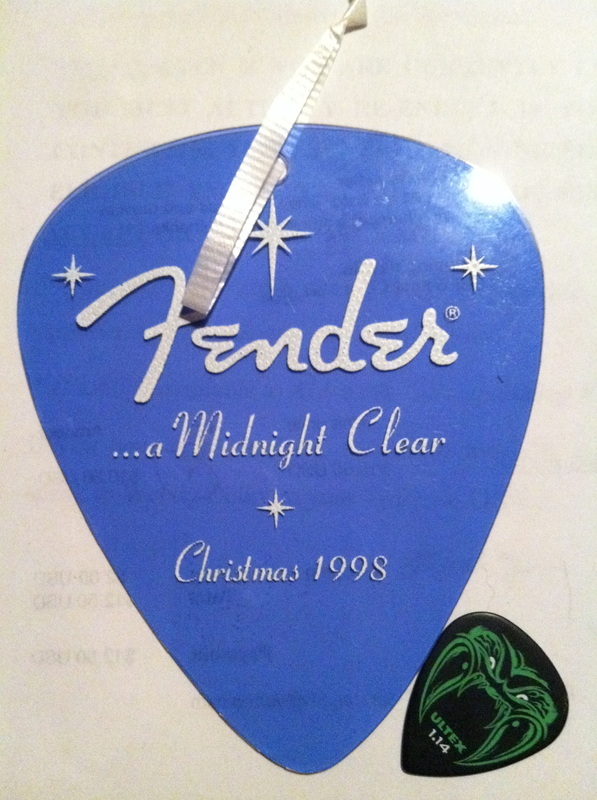 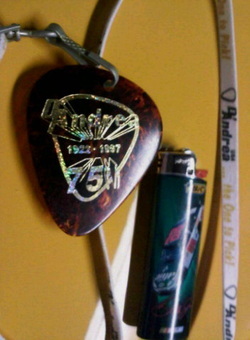 D'Andrea 75th Anniversary 1997 Celluloid Guitar Pick lanyard. 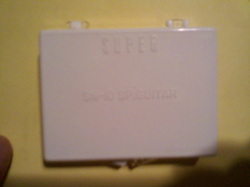 It's huge as you can see. 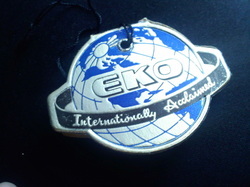 Given to me by a very good friend. 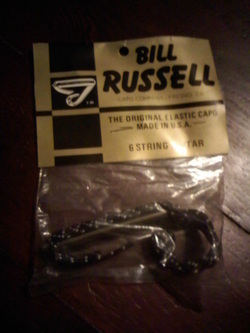 D'Andrea Music Gear 'The One To Pick' lanyard. 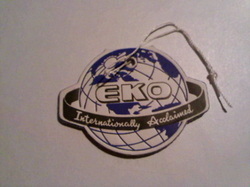 Reverse logo on backside of pitch pipe. 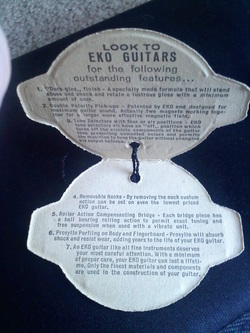 Bottom print says 'Pat. 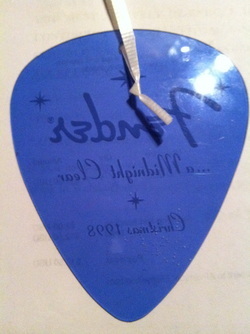 Appl'd For'. 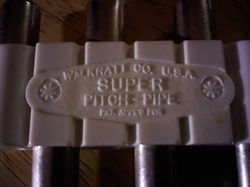 I have no idea how old this is as there is no date of manufacture on the box nor on the pitch pipe itself. 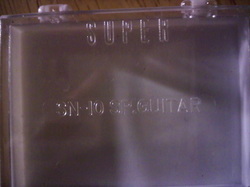 Backside of pitch pipe's box(Top reads 'SUPER', Middle print says 'SN-10 SP. 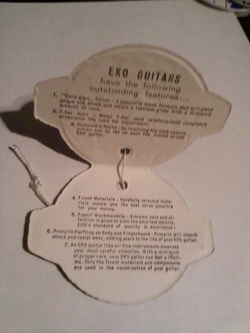 GUITAR' And at the bottom right, 'wm.kratt.co'. 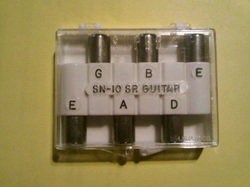 Front, or topside of box, reads the same as the bottom side. 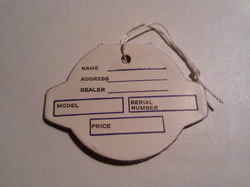 The earliest listing for this item is in Wm. 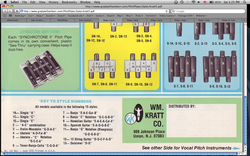 Kratt Co.'s 1978 catalog. 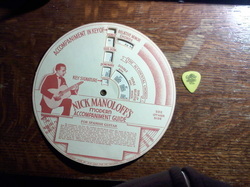 'Nick Manoloff's Modern Accompaniment Guide'(sort of a circle of 5ths but with more 'flare'). 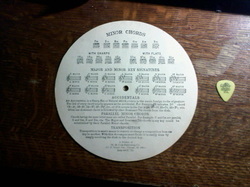 Like the Circle of 5ths, there are two wheels attached in the center as a 'dial' type device. 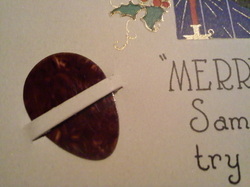 As you can see, it's pretty large in size. 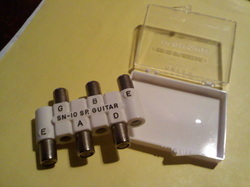 The back view displays key sigs, minor chords, parallel minor chords, transposition...stuff like that. 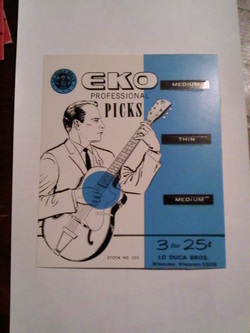 At the bottom reads, 'A Product of M.M. 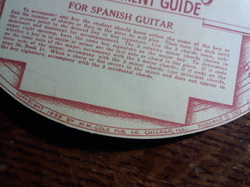 Cole Publishing Co. and they are situated in Chicago, ILL. 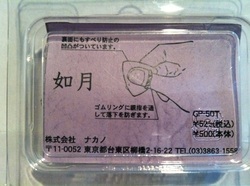 Item # is 441C75c. 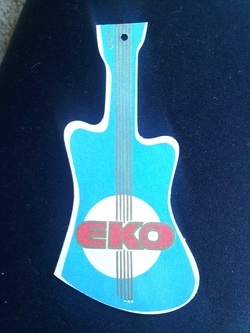 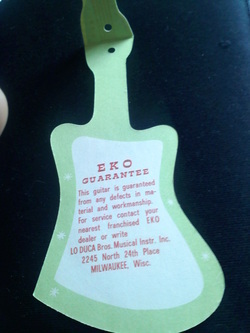 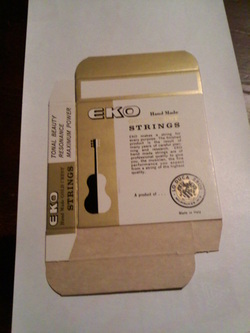 EKO guitar hang tag(front). 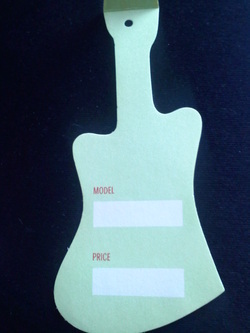 Backside is blank. 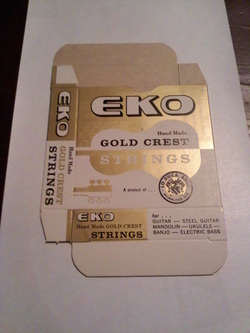 Pickboy 'Koto' picks(Japan) in original box w/insert card! 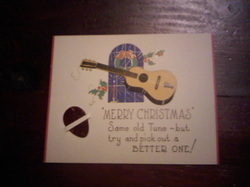 Beautiful example of a Bob Clifton Tu-Way Pick Card.